What conditions does Avar-E Green Cream treat? Stop using this medication and tell your doctor right away if any of these unlikely but serious side effects occur: skin irritation, scaling of the skin. A very serious allergic reaction to this drug is unlikely, but stop using this medication and seek immediate medical attention if it occurs. Symptoms of a serious allergic reaction may include: rash, itching/swelling (especially of the face/tongue/throat), severe dizziness, trouble breathing, signs of infection (e.g., fever, persistent sore throat), unusual weakness, easy bleeding/bruising, yellowing eyes/skin. List Avar-E Green Cream side effects by likelihood and severity. This medication should not be used if you have certain medical conditions. Before using this medicine, consult your doctor or pharmacist if you have: kidney problems. Before using this medication, tell your doctor or pharmacist your medical history, especially of: cracked skin or open wounds (especially on the face or hands). What should I know regarding pregnancy, nursing and administering Avar-E Green Cream to children or the elderly? Before using this medication, tell your doctor or pharmacist of all prescription and nonprescription/herbal products you may use, especially of: skin products containing silver (such as silver sulfadiazine). Does Avar-E Green Cream interact with other medications? Are you taking Avar-E Green Cream? 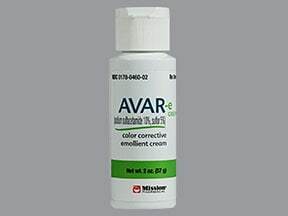 Are you considering switching to Avar-E Green Cream? How long have you been taking Avar-E Green Cream?